Well, at least today is. To be honest, choosing my 4th of July menu is going to be so hard. There are too many recipes that I want to try out. Nothing old, always something new! I am still in shock that tomorrow is the first of July. I am both excited and sad at the same time. Excited because I have fun stuff going on this month. Things like the barn hopefully starting to look more like my new home, a trip to Seattle and um…. eating as much mouth-watering, delicious, summery foods that I possibly can. Because that is what I do in the summer. I am addicted to all the fresh produce. I just cannot get enough! Sad because I don’t want summer to end! I will also be taking over this month as full-time care giver to the now adolescent chicks (yeah my mom actually used that word when describing the chicks newest stage). Actually, I will have to assume my new duties not only for the entire month of July, but for half of August as well! My dad is normally my best bud… and dishwasher, but he’s out of here for a while, so the chicks are up to me … and my not so nearly as helpful brother. I’m also going to be trying my hardest to design the barn to everything I could ever want it to be. It’s gonna be a busy month, but you know what I realized during my little Florida vacation last week? I hate not having anything to do. I thought it would be amazing, but I was just plain antsy. The truth is I really like what I do and I like running around like a chicken with my head cut off. Sure little breaks are a HUGE must, and I need to try to do them more, but for the most part I really just like being busy and seeing things get done. My dad has always said the more you have to do, the more you get done and it is so true. Anyway, now that we know how my July is going to go, let’s talk about these burgers. These are for all the vegetarians who still want to have fun and throw a delicious summer BBQ. Now – they are sort of healthy, but then I just had to add the cheese sauce. Oh the cheese sauce. This cheese sauce is worth the splurge. It’s kind of my new favorite burger topping. As are these crispy, baked to perfection, homemade curly fries. Holy crap. You guys. So flippin good. The curly fries alone are reason enough to buy yourself a vegetable spiralizer. These fries were deemed “best ever” by some seriously tough critics, so you have to trust me on this one. For some reason I really liked the idea of these burgers being heavy on the black beans… and blue cheese. Oops. No, no, no – the healthy stuff totally cancels out any of the bad stuff. It does. Really! Plus, my dad and I have decided we prefer bean burgers to beef. I am not saying we can’t love a really good beef burger, but for the most part, we’ve realized we really like the bean burgers. They are so good every time. My mom the bean hater never knew there were beans in these burgers… until I told her… after she had exclaimed how awesome they were. Again, the buffalo cheese sauce? Yeah, that is really what these burgers are all about. Even if cheese sauce is usually not your thing – try this one! I bet you will think differently. These burger are just a whole new kind of ball game. 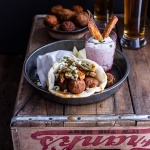 BBQ them up for the Fourth and you and your guests will see what I am talking about. To make the buffalo cheese sauce heat a medium saucepan over medium heat. Add the butter, and once it’s melted and bubbly add the flour. Whisk together to create a roux and cook for 1-2 minutes until mixture gets a bit golden in color. Add milk, stir and turn down heat to low. Continue stirring until milk thickens. Add in the cream cheese, cheddar cheese and continue to stir until mixture is smooth. Stir in hot sauce and seasoned salt and pepper. Taste and add more hot sauce if desired. *To make your own buffalo sauce melt 1 stick (8 tablespoons) (you may use half olive oil or reduce the butter to 4 tablespoons) of unsalted butter. Add 1/2 cup of Franks red hot sauce, 1 teaspoon of seasoned salt and 1/2 teaspoon pepper. Mix well. 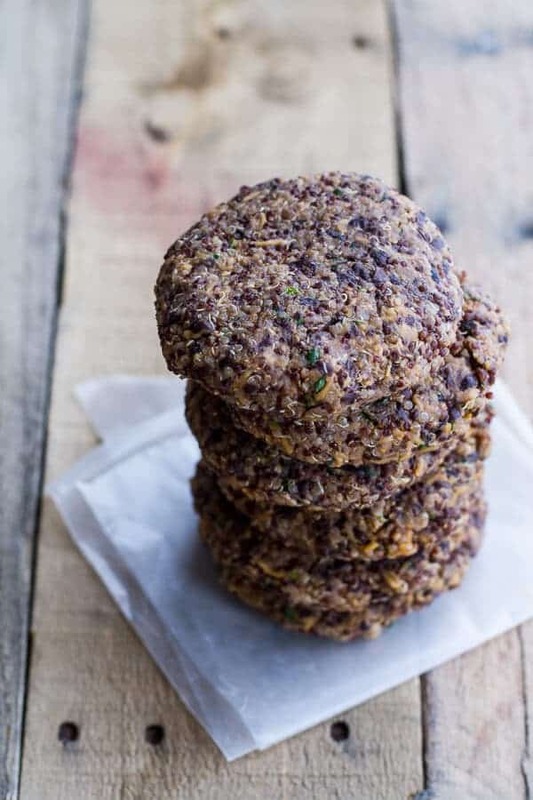 *Adapted from my [Crispy Quinoa Burgers | https://www.halfbakedharvest.com/epic-crispy-quinoa-burgers-topped-sweet-potato-fries-beer-caramelized-onions-gruyere/] and my [Black Bean Mojo Burgers | https://www.halfbakedharvest.com/cuban-black-bean-rice-mojo-burgers-slaw-garlic-tostones/]. Made even better if enjoy al fresco. Or at least I think so, but I love eating eating outside in the summertime! I am the same way. I HATE having nothing to do…I am always creating stuff to do! Like….eat these burgers. My oh my, curly fries and buffalo cheese sauce!?! Dead. I hate hate hate having nothing to do. I love making lists and accomplishing things! But these burgers look amazing! I love a good black bean burger and you can feel so much better afterward than when you eat a beef burger. Me too! I am the same way! Thanks Bri! 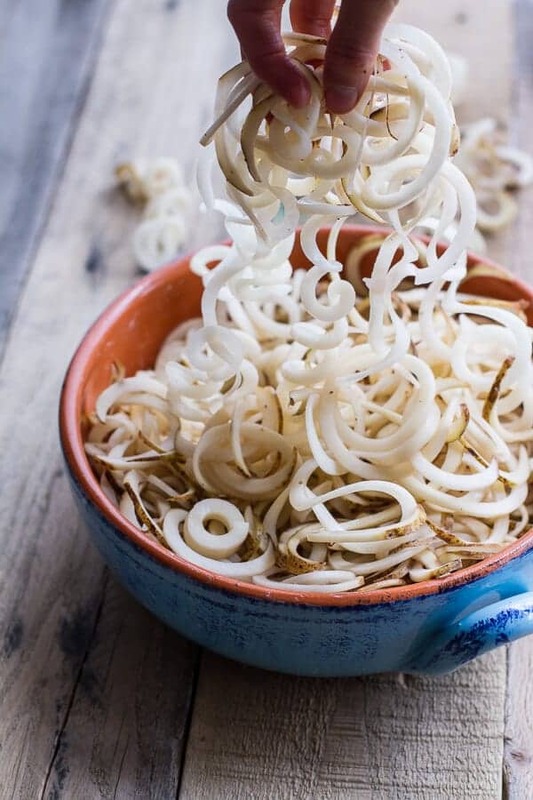 I just bought a spiralizer and I know exactly what I’m going to make first with it. Those curly fries look so good and I love that they are baked. 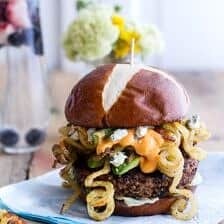 The burgers are a must try I love a good black bean burger and with that quinoa I’m sure the texture must be great. Oh so perfect!! Hope you love these! Thanks! This burger looks AMAZING (also slightly calorific but all burgers should be)! 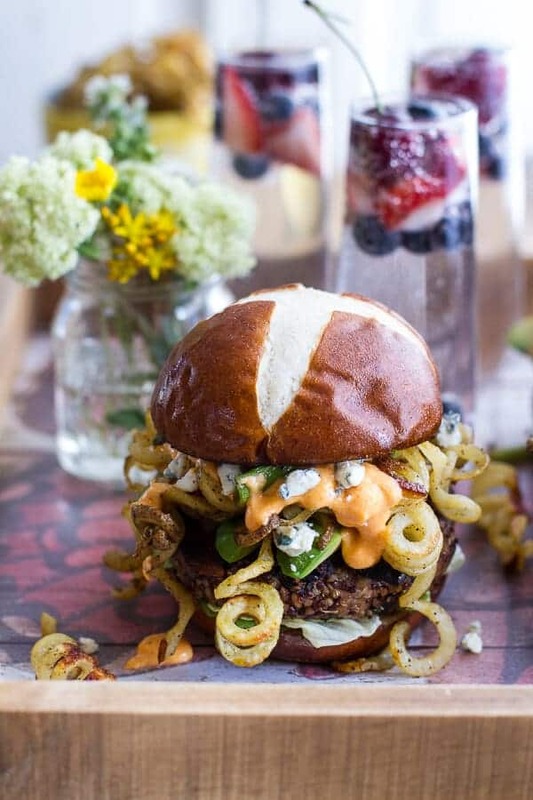 I am a lover of all things blackbean but never thought to make burgers with them and quinoa. These curly fries make me smile too. Have a marvelous week Tieghan! Thanks so much, Melanie! Hope you are having a great week! 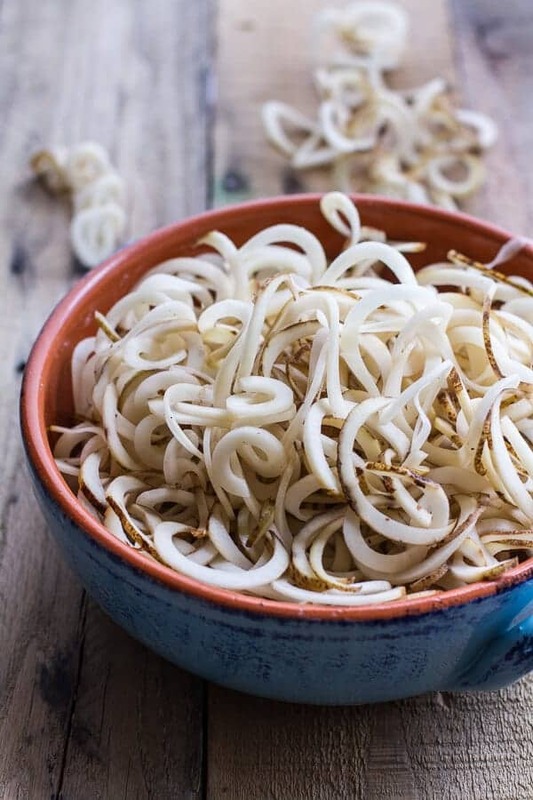 I’ve had that spiralizer in my Amazon shopping cart for a while now, time to bite the bullet and order! 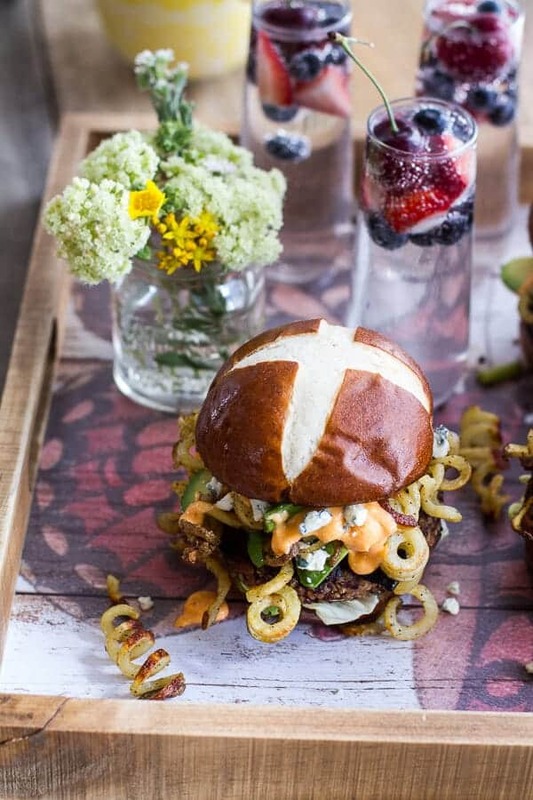 And I love black bean burgers, must try this recipe! I do the same thing with my amazon cart. It take me for every to actually hit purchase! HA! This looks crazy good! And I can’t wait to see your barn! This burger looks epic!! And those frie on it are to die for. This burger beats beef anyday! This would be fantastic for the 4th of July! Pinned! Ha! My family is the same way, such downers!! Perfection! I have to say, sometimes, you just have to splurge with the cheese.. and the buffalo cheese sauce? OMG! I’m thinking about dipping those mouthwatering curly fries into that cheese sauce! On the burger and on the side, I’ll need 6lbs of potatoes! Thank you for the recipe and inspiration! You are a freaking genius!! These burgers are pure art! these look unreal! holy smokes. i’m definitely going to make this recipe. such a stunner! thanks for sharing. 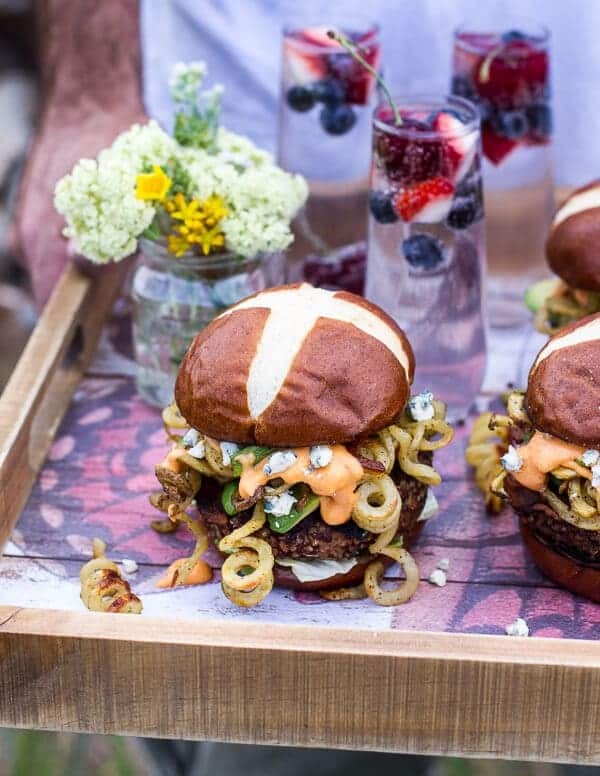 Ahhhhh these burgers look SO ridiculously delicious!! Those fries alone are enough to make my stomach start to growl, but with all the other goodness crammed into that burger…geez. Can you open a restaurant please?? Haha! I would never last. LOL! 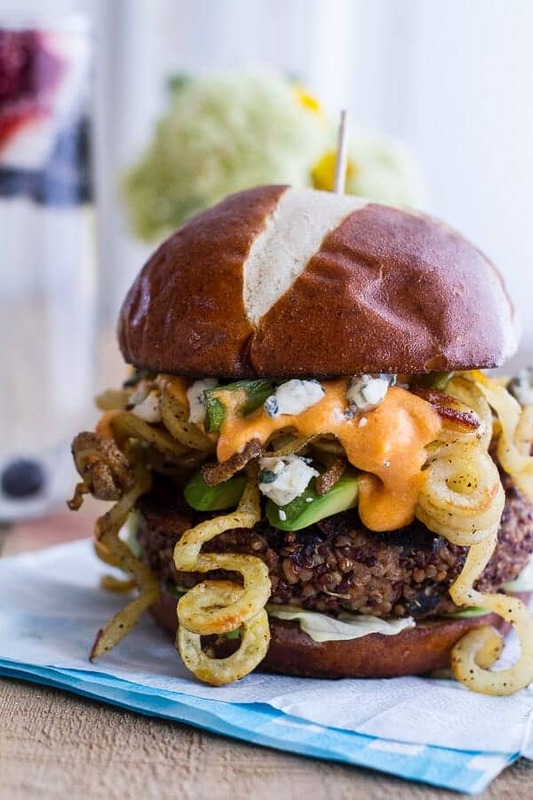 Every burger should be topped with curly fries! Sean would die a happy man if I bought a vegetable spiralizer and made curly fries on the regular…amazing! These look so good and I am always down for cheese sauce! I cannot wait to see the next barn update! Oh how perfect! 🙂 Thanks so much and I hope you love these and enjoy the spiralizer! Question: Can I assemble the burgers and then freeze? It’s just me and the hubby. Can’t eat all at once. It would be handy to have these in the freezer along with my form-a-head beef burgers. Yup! You totally can, the freeze beautifully! Hope you love these! OH boy, gonna make these -quinoa -beans -avocado +beef +bacon for our Omnivore Extravaganza! Haha! Love that! Thanks so much, Gerry! Black bean burgers are my favorite. I love them more than any other burger. These look so good, I am actually salivating (and making an embarrassment of myself at work because of it!) Pinning to make this weekend! Thanks Christine!! Have a great weekend! 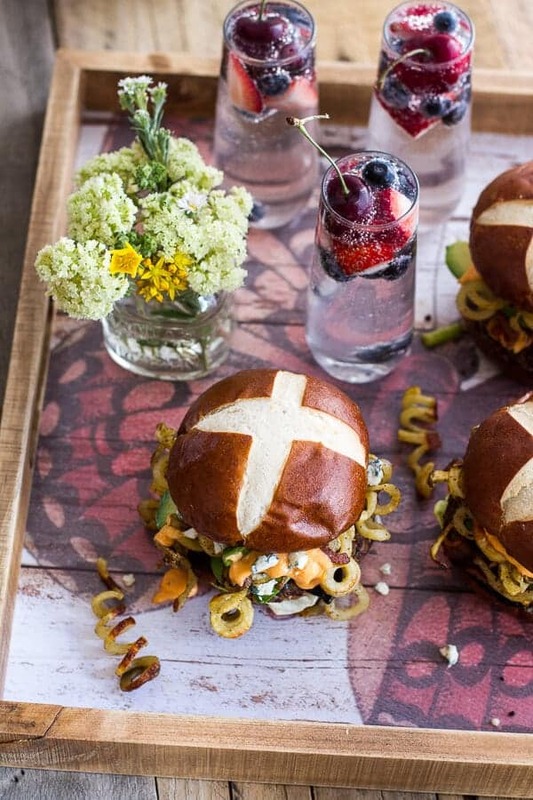 Veggie burgers are right up my alley…and these look like a winner! Pinned! OH MY FREAKING GAAAAH!!! These look amazing. I just saw them on Pinterest and was like “I know that has to be Tieghan…” and it was! HA! Love love love. 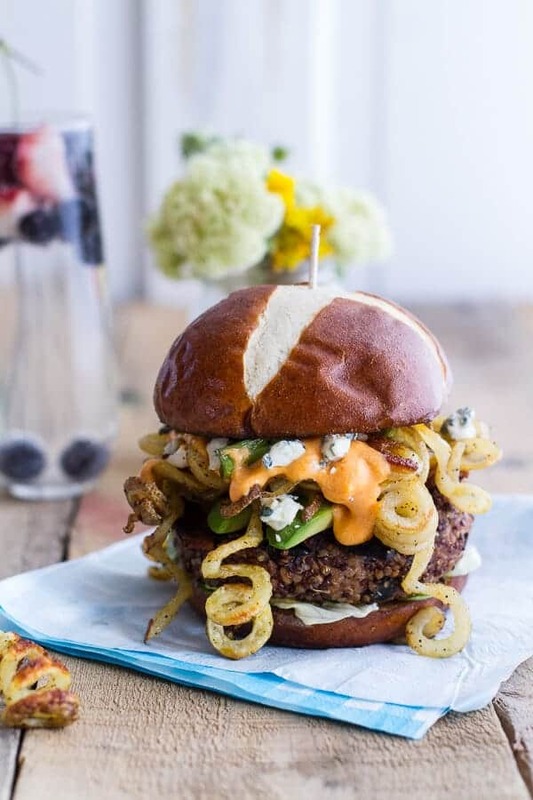 Well, I was coming to your page to find the recipe for the epic crispy quinoa burgers to make again, but came across these first, now I have to change my grocery list!! I am not a fan of blue cheese so I will sub another cheese for it, I was thinking goat? any suggestions? Can’t wait to dig into these!! Haha! Thanks so much! Hope you love these too! I think goat would be amazing! I love goat cheese and I think it works awesome with buffalo flavors. Great choice! Thanks! 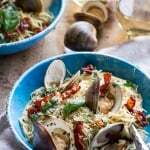 I am making them tonight, and am pumped! Another question for you, did you make your own hamburger buns? If so is the recipe on your blog? Thanks again! Hey Steph! Hope you loved these! 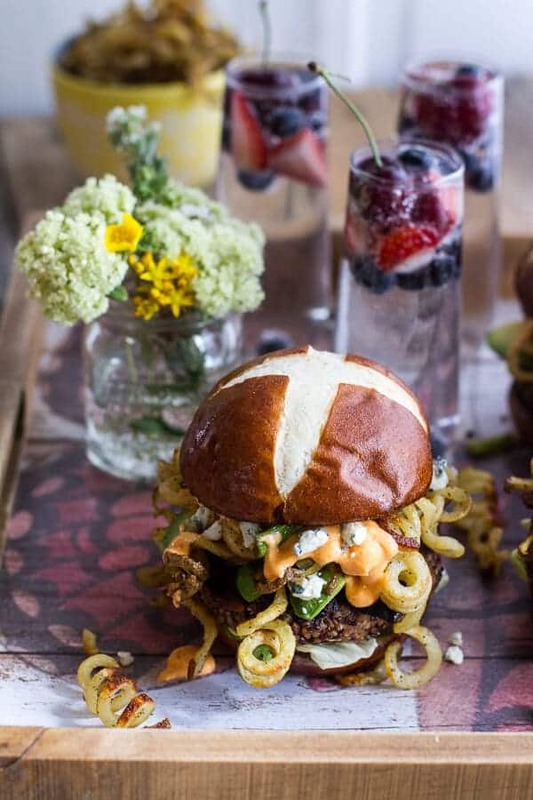 I did not make these buns, but I have a few burger bun recipes on my site. You can find then here. Honestly. These are incredible, and the curly fries are out of control. I need a spiralizer yesterday. Thanks Shaina!! And you do, you would love it! Made these a few nights ago and I made your samosas with the peach jalepeno chutney yesterday. Both were excellent recipes. I made some mac and cheese with my left over cheese sauce. I modified the samosa filling with eggplant and bell pepper since I can’t eat carrots or corn and they were awesome! I’m addicted to the chutney! Every time I pass the fridge I have to have a bite. Love your blog!! Aww!! Yeah! Thanks so much and I am so excited you liked my recipes. Thanks Lindsay! Can anybody help me, is the quinoa cooked? 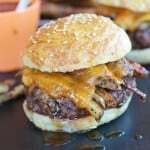 I love the recipes from this blog, they always look and taste so good! =) Good Job! Hey Denise! Thanks so much! This recipe calls for already cooked quinoa. Please let me know if you have anymore questions and I hope you love these burgers! Hey Jill! Yup, I mean buffalo wing sauce. I make mine by adding equal amounts melted butter or oil with equal amounts hot sauce + a dash of seasoned salt. I’ve made these twice and they fell apart both times. There were delicious, but didn’t stay together. Any idea why? that is really weird. I never have problems with these falling apart. Are you using all the ingredients? If so, I would try one, place them in the fridge for 30 minutes before cooking and two, making sure that you cook the first side completely before flipping. Let me know if you have any more questions and sorry for the trouble! This was going to be my question as well! I’ve also made them twice. The first time, I salted the water when I cooked the beans so they were a little too hard to mash properly and I thought that was the problem. Unfortunately, second time the same thing, even though I skipped salting the bean water and cooked the beans a little longer to make sure they were really soft. I was certain that the problem was the beans the first time, so it was super disappointing to have that happen again the second time. Making the patties thinner seemed to help some, as did cooking them for a bit longer on a lower heat. Also, on the second batch, the last ones we made seemed to be less crumbly, maybe because some of the liquid evaporated out while the mix was sitting? Will definitely try chilling the mix next time, though, because these are too delicious (even when crumbly) not to keep trying. On the bright side, the crumbly bits that won’t stay on a sandwich work great as a next-day salad-topping. How do you make such great curly q fries? I have the sprilizer but they just seem to lay flat and curly not perfectly bouncy Arby’s style like Yours. Hey Marci, I really do not know. Maybe I just got lucky? So I am of no help! There is cream cheese in the ingredient list for the cheese sauce but then not mentioned in the directions. I assume it goes in with the cheddar cheese? Or is it not an ingredient? Hi Linda! Recipe is fixed, it goes in with the cheddar cheese. So sorry for the confusion. Hope you love this! Oh my! 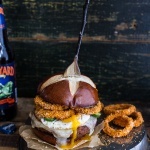 I’ve got to make this burger! !